The audience takes their place at the edge of the water. On the water is a platform. 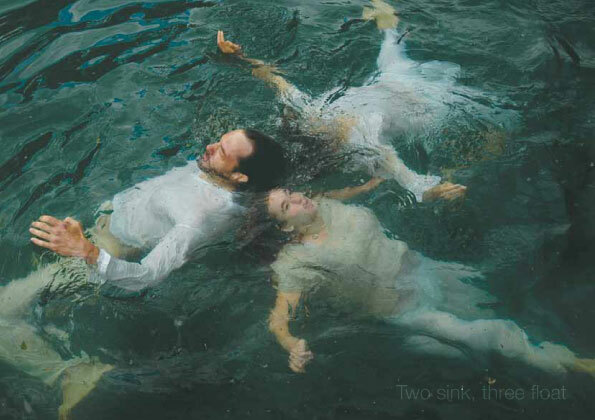 Three dancers take the audience with them into their own world, where other realities are constructed, above and below the surface of the water. Thus, the evidence of breathing is questioned and turned on its head. In the performance the dancers create the illusion that they can breathe under water. The realistic surroundings gets transformed by dance and movement into a surreal entity. The dance is situated above and below the water’s surface; in the water and on the platform. The platform is a symbol for the perceptible, the conscious, the known. The water symbolizes the protected, unconscious, unreachable. Objects appear on the surface. Wet bodies are dragged onto the floating platform. The body, half in the water; physical meetings and a figure that disappears instantly. The performance is built around three characters, two women and one man, who behave differently towards each other and towards their surroundings. The audience is brought into a recognizable game of humans behaviors. letting go, keeping close and leaving behind. Through movement the three performers translate this unknown amphibious environment. The audience enters a certain atmosphere, an atmosphere where the natural world becomes a necessary part of the whole. It’s as if the audience simply passes, on their way to somewhere else. It seems that you catch a glimpse of a world that is always there, hidden from sight . The underlying tension of the movement material comes from the physical possibilities and limitations that the water and the platform impose. Inspiration is taken from the water, wetness, depth, weightlessness, dry land, breath and nessecity.